"I am so scared...I don't know what's out there...we are going to die out here!" The summer of 1999 was home to one of the most hyped events not only in horror history, but cinematic history in general. History remembers it as one of the most successful independent productions of all time, but those who were around and aware during that summer remember the film as an event that was months in the making. Purported to be based off of real events that actually resulted in the deaths of the "actors" involved, the film had a marketing campaign like no other. There was an aggressive online viral marketing campaign that was ahead of its time, and the film's mythology even received its own documentary. By the time it received its wide theatrical release on July 30th, the hype was beyond belief. Growing up, I had one friend in particular that was like my brother in all things horror--we practically grew up in the genre together--so it was only natural that we set out to experience the tour de force that is The Blair Witch Project. According to local legend, the Blair Witch has been responsible for the disappearance of children in the area for centuries, and her spirit even compelled a local man to abduct and kill seven children in the 1940s. In October of 1994, three students from the University of Maryland (Heather Donahue, Michael Williams, and Joshua Leonard) set out to film a documentary about the witch, who supposedly still haunts the woods near Burkittsville. However, the three students never returned and disappeared without a trace until their footage was discovered a year later. This footage reveals that the three became lost in the woods and experienced several odd events: piles of carefully stacked rocks, strange effigies hanging from trees, and the unsettling sounds of footsteps and crying children at night. Ten years ago, I think the film was personally a victim of its own hype. My friend and I left the theater somewhat unable to process what we'd just seen, and we both felt somewhat cheated that the film never really gave much in the way of answers. I certainly didn't think it was bad at all, but it didn't strike me as the next great thing in horror; I saw bits and pieces of the film from time to time when it came to home video, but I never sat down and actually watched it again until very recently, and it was a bit of a revelation. As with anyone, I suppose my own tastes evolve and mature over time, but I think the primary difference was the removal of the film from its massive hype. Instead, I was able to enjoy the film for what it was instead of what I thought it would be ten years ago. There's no doubt that I've always enjoyed the concept behind The Blair Witch Project; in fact, some of the most effective moments come early in the film when the students are interviewing various Burkittsville residents who reveal their own experiences or second-hand accounts of the witch. I'm a sucker for a good urban legend story, so the hook for the film still reels me in without question. The idea of a 17th century witch wreaking havoc in the woods of a small rural community is ripe for some frightening and unsettling scenarios, and ten years later, I've realized that the film executes this in a unique and effective manner. As previously stated, the film doesn't reveal much, if at all, outside of the odd occurrences recounted above. Instead, the film is a much more cerebral thriller and allows viewers to speculate just what the hell is going on out in those woods. Indeed, by the end of the film, that one overriding question is provided in lieu of any sort of answers, as we're left with one of the most infamous endings in horror history. While the ending may leave you wanting more, I don't think the film could end any other way; in fact, the creepiness of the final shot was one thing I enjoyed about the film when I first saw it, and I think it's even better now. The execution of not revealing much works well in conjunction with the film's style, which immerses you in the event as it was experienced by the characters. This allows viewers to simulate the experience of being completely lost in the woods and being terrorized by an unknown force. This is a bit of a primal fear of the human condition, which explains why so many horror films choose it as a setting. As someone who has lived literally a few feet from the woods his entire life, I can verify its authenticity--there's something very unsettling about hearing unknown sounds in the pitch black of night. Some of the film's most effective moments come when the camera captures nothing except the darkness and these strange noises. One weakness the film still exhibits is a stretch in the middle where the strife among the three takes center stage. Indeed, for the uninitiated, a lot of the film's running time is dedicated to the three characters yelling at each other, and Heather particularly becomes annoying at times. Still, this helps to create a feeling of authenticity, as it all feels so raw and unfiltered, and all three (especially the two guys) really look like they're scared shitless at times, which was probably due to the fact that most of the events were staged without the actors knowing what was going to happen. Thankfully, however, the documentary approach allows the film to skip unnecessary events and keep a break-neck pace for the most part. The Blair Witch Project is very much a film of ideas instead of a visceral one; there's only one small instance of gore that's there not to gross you out so much as to make you keep wondering just what's going on. It's a film that plants itself in your consciousness and exploits the universal fear of the unknown. The film seems to have experienced a backlash similar to my initial reaction, as the horror community seems to regard it as an overhyped disappointment. However, I think this one deserves a re-evaluation because it really is one of the most unique experiences in horror, as it's one of the most effective uses of Cinéma vérité in horror in the vein of the original Texas Chain Saw Massacre and Cannibal Holocaust. 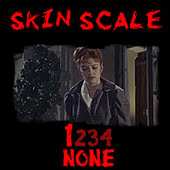 The film's been released on DVD once by Artisan, and it features a full-frame transfer that's reflective of how the film was originally projected (so don't bother looking for a widescreen version). Given the nature of the film (which was shot on Hi-8 and 16mm), the transfer obviously isn't going to utilize DVD technology to the fullest, but it gets the job done. The 2.0 stereo soundtrack is more effective and more vital to the experience, as it manages to still sound immersive despite the lack of surround activity. 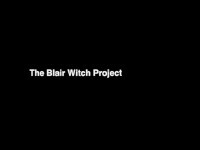 There's a host of special features, including a commentary with the directors and producers, "newly discovered footage," trailers, and "The Curse of the Blair Witch," a documentary taking a further look into the film's mythos. The disc is especially cheap these days, and it's a no-brainer purchase. Wait for the sun the set, dim the lights, and crank this one up and let the experience unfold. Buy it!